First Round �- Sean O'Hair, Rod Pampling and Nick O'Hern at 7-under-par 65 led Aaron Baddeley, Tim Herron, Ernie Els, Bubba Watson and Ryan Moore by one stroke. Second Round - Adam Scott at 12-under-par 132 led Pampling by one. Baddeley and Watson were two behind. Third Round - Pampling at 15-under-par 201 led Scott and O'Hair by three. Baddeley, Will MacKenzie and Stewart Cink were four back. Cut Notes: 72 players at 2-over-par 146 from a field of 106 professionals and one amateur. Weather: Thursday: Mostly sunny and warm with a high of 89 degrees. SW winds 5-10 mph. Friday: �Partly cloudy with continued warm temperatures reaching 88 degrees. SW winds 4-8 mph. Saturday: Partly cloudy and warm with a high of 84 degrees. SW winds 4-8 mph. Play was suspended at 1:28 p.m. due to a dangerous situation. Play resumed at 4:00 p.m. and the completion of the third round came at 8:16 p.m. Sunday: Due to threatening weather, final-round tee times were moved to 8:00-10:01 a.m. in threesomes off Nos. 1 and 10. Due to early-morning thunderstorms, play was delayed one hour, with play beginning at 9:00 a.m.
K.J. Choi fired a final-round 65 to win the 32nd Memorial Tournament at Muirfield Village Golf Club by one shot over Ryan Moore. 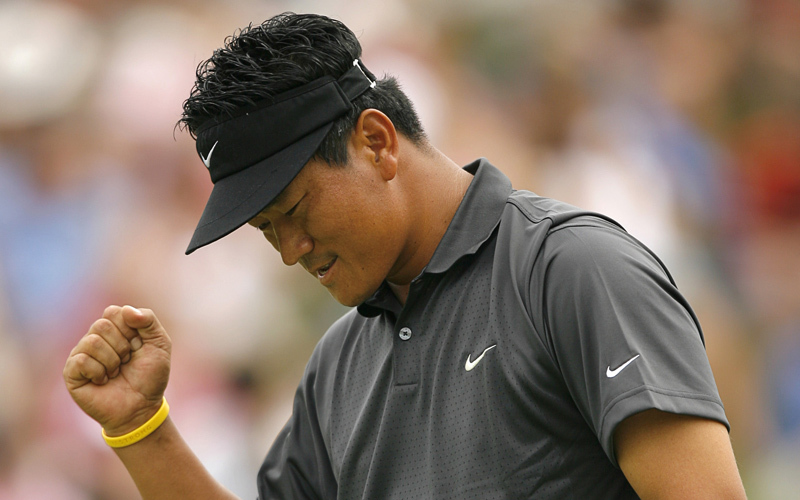 Choi's victory at the Memorial was his fifth-career PGA TOUR win. He has recorded at least one victory in each of his past three seasons on TOUR. Choi began the final round five shots behind third-round leader Rod Pampling. His victory is the largest comeback on the 2007 PGA TOUR in a final round. Playing in the final group, Pampling and Adam Scott were one-stoke back with two holes to play but each fell short as they bogeyed No. 17. Pampling pared the final hole to finish in a tie for third with Kenny Perry, while Scott finished with back-to-back bogeys and dropped into a four-way tie for fifth place.